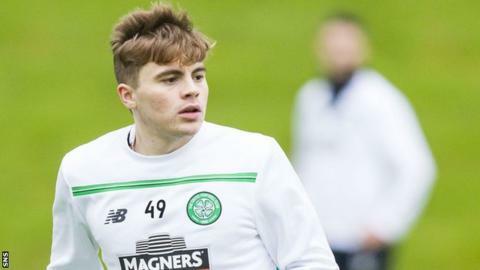 Celtic's attempt to secure James Forrest on an extended contract have been held up by the Scotland winger's agent, according to boss Ronny Deila. Deila said earlier this week that the 24-year-old was the next member of his squad he would like to tie down. "We have tried to get hold of his agent, so you can write that, when he has time, he can come in and discuss an offer," joked Deila. "We have tried for a while, so hopefully he will come - like Santa." Deila had been quoted at the weekend as saying that talks had been held with Forrest, whose current deal ends in summer 2017, and that the terms offered appeared to be agreeable. "Maybe he has a lot to do," he added about attempts to complete a deal with the agent. "I don't know how many players he has. "It doesn't concern me, but hopefully we will get contact now and start talking."